FACT: Every stage of traditional publishing is slow. FACT: The waiting can drive you batty. FACT: Distractions between stages are a necessity. I’m not ready to start my next novel. It’s percolating, but the idea isn’t hot enough yet. The concept hasn’t reached its boiling point. So, while it simmers, I’ve been fighting off the crazies by both reading and writing (shorter pieces). There is this [anonymous] bestselling YA author, see, and I’ve tried my best to like her books, to enjoy them, to discover their appeal. Last week I made a third attempt—the first book in a trilogy—in hopes that this would be the one which would win me over. No ma’am! Not even close. I slogged through it, forced myself to just.make.it.to.the.last.page, which is a horrible thing to have to do with a book. And thus, my non-relationship with this author has officially ended with a whimper. Flip that coin over. Let’s talk about some BANG. Through the wonder of word-of-mouth, which is to say: a random Tweet floating by in my feed, I strolled a block to my local library & checked out Rainbow Rowell’s Eleanor & Park. Now, let me state for the record that I rarely read Contemporary YA. YA Fantasy? Yes. Non-fiction about psychology, science, philosophy, astronomy, etc? Why yes please and thank you. So this wouldn’t normally be a go-to novel for me. Well, I suppose the best testimony for how much I dug it, is the fact that I ordered Rainbow’s new release, Fangirl, the day it came out. This is the first hardcopy book I have purchased in probably a dozen years. My m.o. is 75% borrow from the library and 25% purchase for the Kindle. So, obviously, excited. Whatever your preferred genre to read and/or write, whatever tastes you normally fall back on, I highly recommend both of these books. Because: quirky, endearing, relatable, solid. Now, on to the writing-as-impatience-repellant. Flash fic keeps me loose. It’s like the warm-up laps in a pool before swimming from Cuba to Florida. It purges ideas—exorcises them, if you will—to clear out headspace and make room for more. But it has its limits. Flash fic is akin to eating a pack of Smarties when you really really want chocolate. (Y’all know exactly what I mean…) So, I chew on it when there’s no time-chocolate, attention-span-fudge, or even complexity-syrup in the house. But it doesn’t satiate the craving for: more, a robust arc, deep characterization, subplots, intricate weaving of symbolism or layered themes. Then there’s this other project, which isn’t so much of a definite thing. Today I submitted my short story, Bastardbreed, (weighing in at 6,200 words) off to the guys heading up a Clive Barker fanfic anthology. (Which feels a little weird for me to say. Like fanfic is somehow unclean or not real writing. Which is silly. Because I created my own offshoot of a world, birthed brand new characters, and incorporated all the complicated elements listed three paragraphs up.) If the story makes the cut, it won’t be available for public consumption until Fall 2014 when Tor releases it in simultaneous hardcover & paperback. FACT: Traditional publishing is a reaaaaaallllllyyyy slow process for high-octane chaps like me. FACT: I won’t let my wiring keep me from pursuing that end. 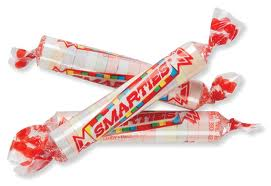 FACT: I’m writing, reading, percolating, producing, and sucking on Smarties until the chocolate comes. Update: So once this posted, I found out that Canadian *Smarties* actually ARE chocolate. FACT: I feel ripped off, ‘MERICA! FACT: I should move to Canada. FACT: Everything should be made of chocolate. Except that would be really messy & make many things anti-useful. Nevermind. NOT A FACT after all. This entry was posted in Invisible Ink, Short Stories, Writing. Bookmark the permalink.